Would have matched that plaid had I known it was going to show through the reverse side of this fabric. And while I was at all this sewing, I managed to make it through much of the Wool series of post-apocalyptic sci-fi novels by Hugh Howey. Admittedly they are short and quick reads. One of the better entries in that genre. Thanks to DS for recommending the series. Be sure to put a pin here to hold everything in this orientation before you begin sewing the hem. 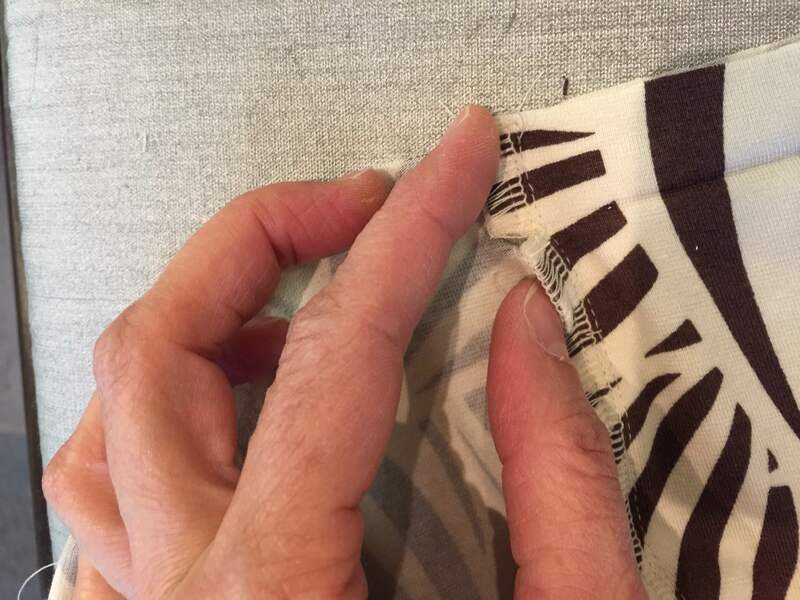 I have been doing this for years and have never had a seam pull out in the hem area as a result of that clip. Please ignore the bad manicure, or actually, the complete lack of manicure, and ragged cuticles. I went straight back to the lotion after every hand-washing and cuticle cream at night regimen as soon as I saw this photo. Just because I’ve never actually sewn an official SWAP wardrobe, doesn’t mean I don’t plan at all. 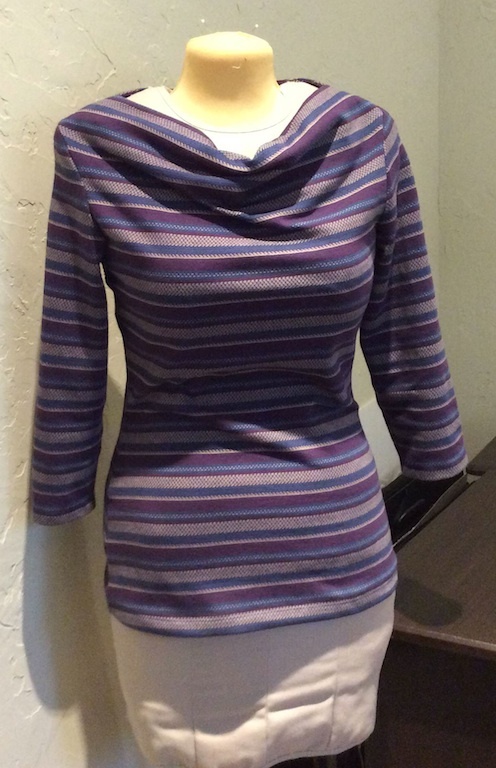 Before heading to Los Angeles to PatternReview Weekend to buy fabric, I decided I wanted to buy knits to make tops that would coordinate with crop pants I own in basic colors and get some Ponte in solid colors to make pull-on stretch crops. This is the group I picked up for around $14 at the FIDM Scholarship store after viewing the latest group of Oscar-nominated costumes on display there. Later I went to Michael Levine’s and picked up 3 pieces of Ponte and a few other knit pieces in their by-the-pound loft. So I call it Buying With A Plan, BWAP. 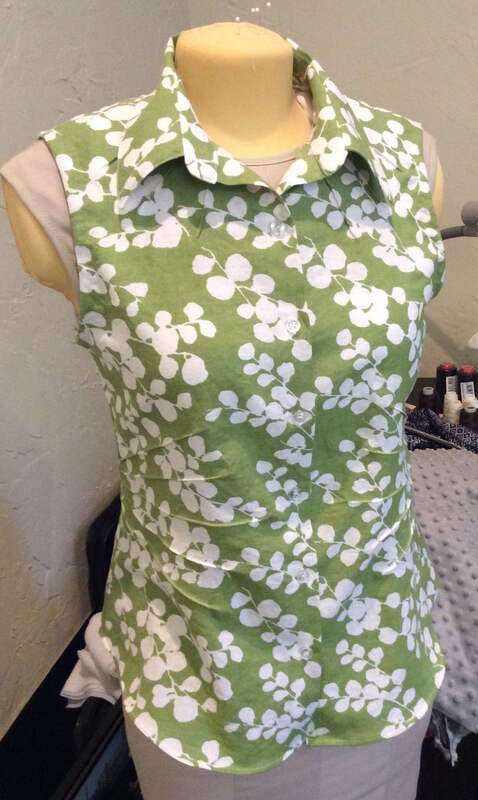 The sewing comes later and everything should dovetail right into my basic wardrobe without a hitch, but I am flexible as to patterns used and have no firm plans as yet, unlike with a true SWAP wardrobe. I adhered pretty well to my rules going in, only buying one fabric that wasn’t a knit in a basic color or colors that would coordinate with basic pieces in my wardrobe. My go to solids are Navy, Dark Brown, Black and Red. My stash reduction project has gone so well that I was mostly down to knits that I had purchased with someone else in mind that are not colors I generally wear. 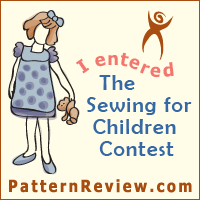 So now I can start sewing quick knit tops again with my favorite patterns. The only changes I made to the pattern were the facings. I always eliminate facings when I can and use self bias tape I make with one of my bias tape makers. I’m pretty sure I’m not going to give up those little devices like our workshop instructor Lynda Maynard suggested we should, but I may try her stretch pressing method on the cut bias strips before running them through the bias tape maker to see if I get fewer ripples when I bind necklines and armholes. I will definitely use her method of sewing darts with a single thread next time I have a dart to sew. 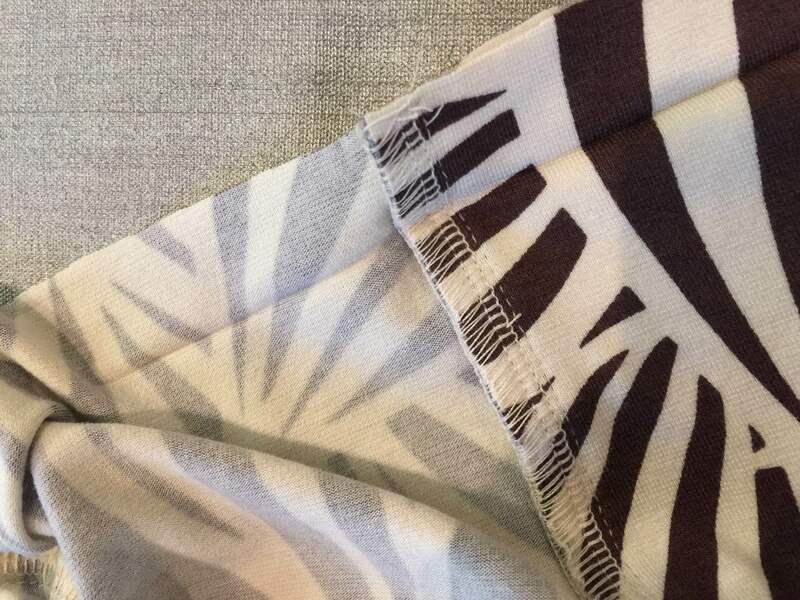 Now I’m trying to decide if I should sew my other hoarded piece of rayon batik with this same pattern or choose another, but that decision is on the back burner as I stage the knits I bought in LA with patterns and quickly sew them up for summer. This rayon top should be a staple of my summer wardrobe as it will go with black or brown or khaki. I love it when a plan comes together and I can reach in to my closet and have many options that all play nicely together. This is the magic result when you BWAP instead of on impulse. 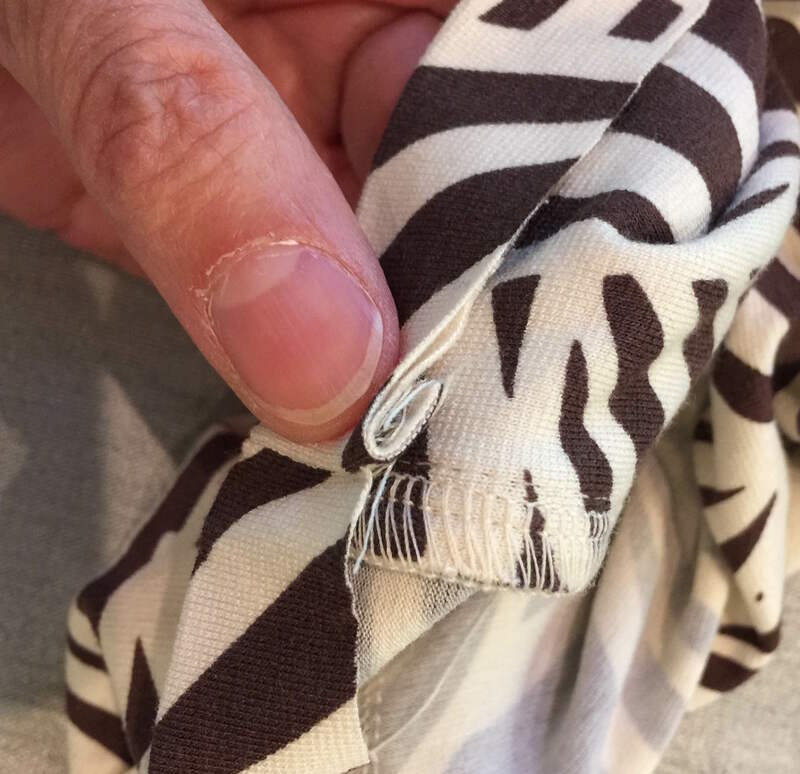 Pretty fabric is often not really useful and useful fabric in the wardrobe doesn’t always look pretty on the bolt. How long it has taken me to learn that lesson! Useful is the new beautiful. Many thanks to the wonderful volunteers who make PR Weekend events possible. They did an amazing job of organizing this event and I had a terrific time! 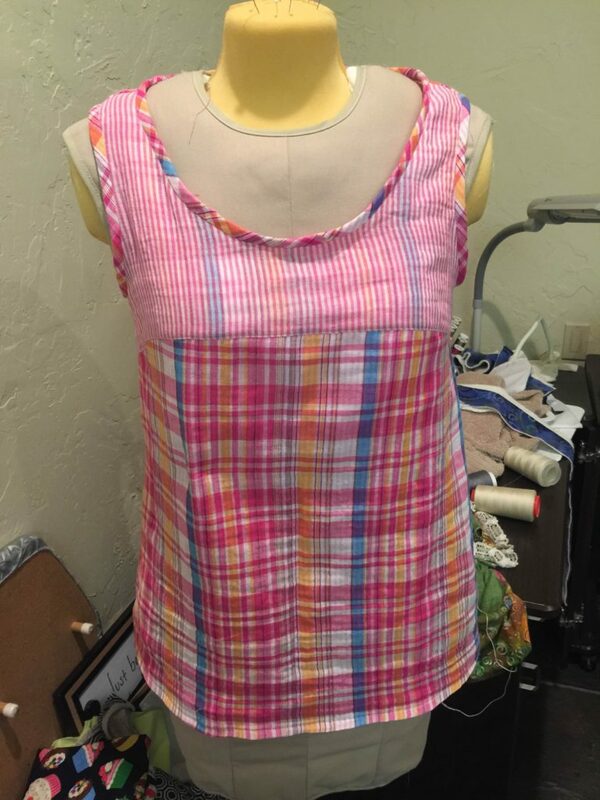 In January I decided to join a monthly goal sew-along on Pattern Review. My goals each month so far are modest in the hopes that I can actually achieve them. This month I had just 2 goals: to use a piece of wool purchased at the last Pattern Review Weekend event in Los Angeles to make a coat or jacket and to finish the machine quilting on a small quilt. For the coat, the piece I had in mind was a lovely soft and lofty green wool tweed. I had chosen a pattern also. 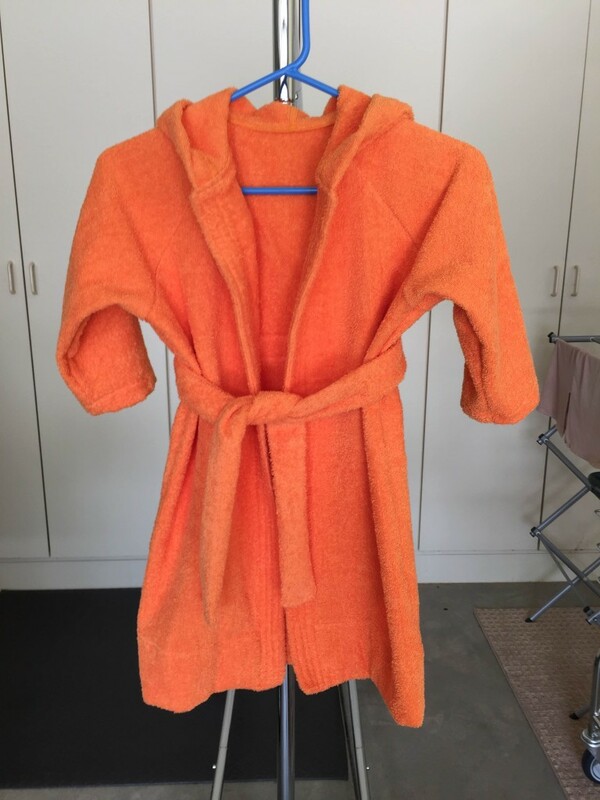 Sadly, I did not have enough fabric to make the chosen pattern, but while I was riffling through the coat and jacket patterns looking for one that would work, I came across this one and remembered I had another piece of wool that might work for this rare cardi pattern for woven fabric. I’d say it did work. I’m very happy with this jacket and got compliments (I think they were sincere) from everyone who saw me wear it today, minutes after finishing it. For more technical details on how I made the jacket, I’ll refer you to the review I posted. Why did I title this post Back for More? Well, I’m headed back to Los Angeles for the next PR Weekend there this spring. I figured before I bought more fabric I ought to try to use up everything I bought there last time. I think the green wool is the last piece from the last trip. I probably won’t get that sewn up, but I did find a suitable pattern. It’s just that one hardly needs heavy coats when temps are running in the 65-75 degree range most days. Today was a bit chillier so that’s why I wore the new coat today. February is slipping away but I may yet have some time this weekend to attend to that quilt. I’d say it’s about 60-70% quilted. There’s hope. 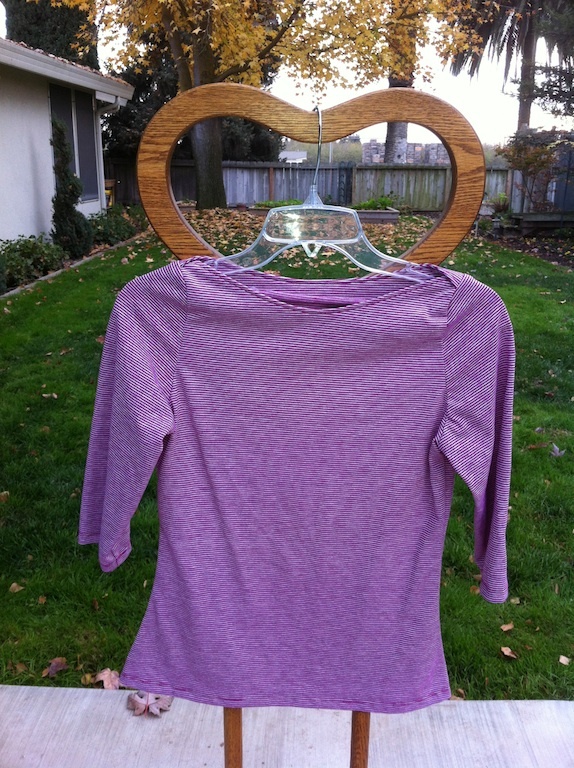 This cardi is my first stab at McCall’s 6844, which is a Best Pattern of 2013 on PatternReview.com. I think I’ve owned it since 2013. 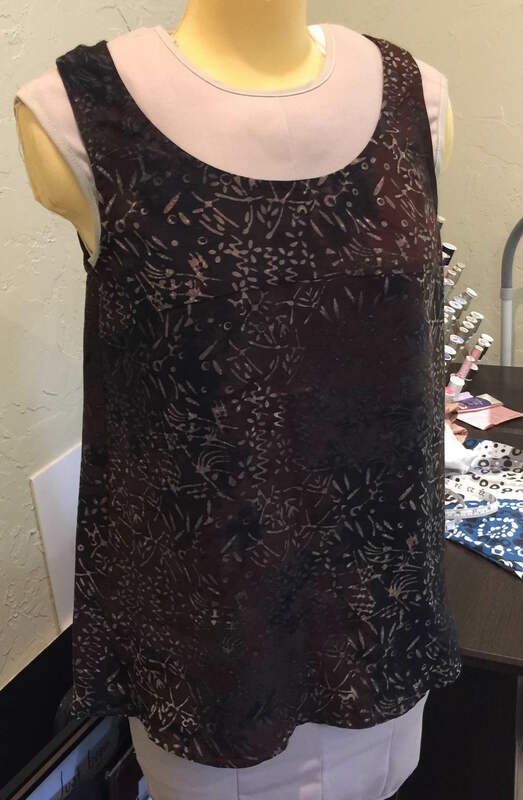 Seeing the potential in it immediately, I bought it in one of JoAnn’s so-cheap-you-have-to-buy-ten pattern sales and I’ve had it around for a while. I planned to make it up with some off-white French Terry and several months ago I polled some sewing/style friends on whether or not to use the peplum version or the straight-no-peplum version. I got some curious responses. It turns out that not everyone knows the word “peplum,” although everyone was familiar with the detail once I explained it, and once we got past the initial confusion, everyone who cared voted for the peplum. So by the time I got around to actually sewing it up, I had lost the pattern in the moving shuffle and had to go out and buy it again at what passes for full price for patterns. Rats. But I wanted to make this jacket and didn’t want to wait for the next big McCall’s pattern sale. I brought the pattern home and started working on it, doing some of the recommended alterations based on my researches and put the French Terry in for a pre-wash as it looks suspiciously like it will shrink significantly in length to me. While the Terry was in the wash I remembered I had this lovely navy ponte in stash and thought I’d make a wearable muslin. Here’s the result. 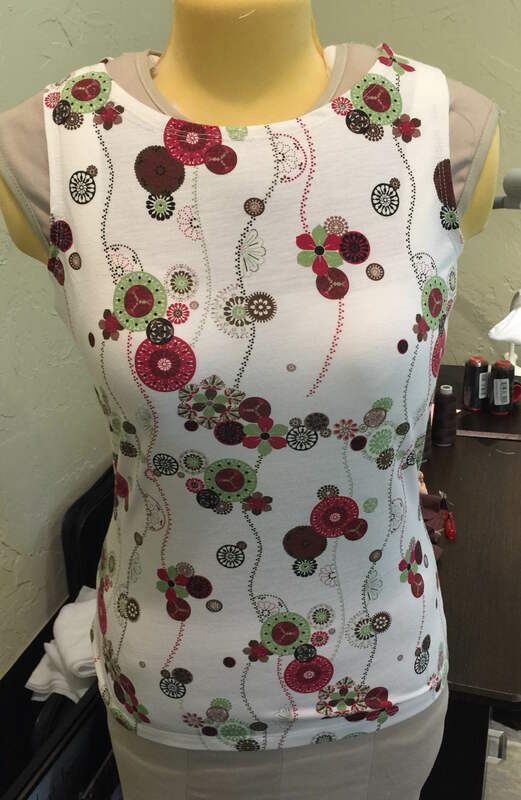 Sizing: Most everyone on PatternReview comments that this pattern runs large so I made a small even though according to my measurements I’d need a medium. They were mostly right, but I did add 1 1/2″ in length, a generous 1/2″ in the body and 1″ to the circle hem of the peplum. I thought the pictures of this view all looked short, even on petite people. I am happy with the length. I also added width to the arms. I don’t recall reading this on PatternReview, but the current Threads Magazine pattern review article features this pattern and their tester commented that the sleeves were tight. 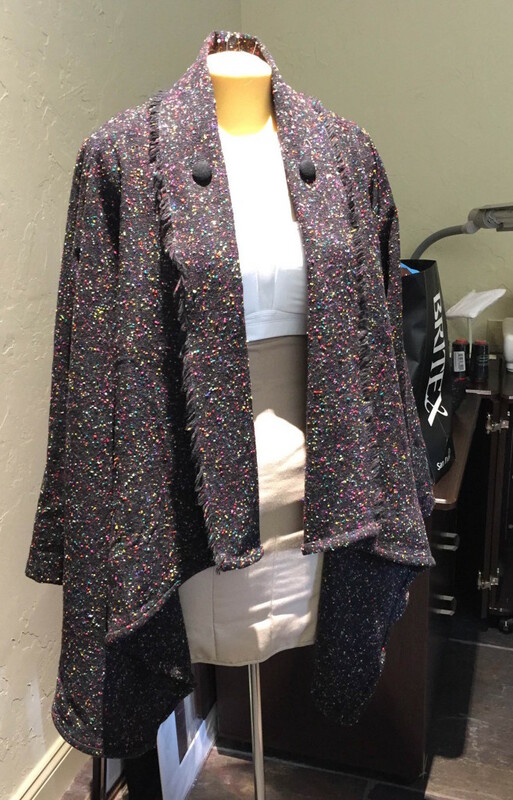 I happened to be wearing a similar style of garment at the time I was making these alterations and compared and sure enough, the sleeves were about 1″ narrower through the bicep area than on the jacket I was wearing. So I made the alteration for this given in Fit For Real People. I used the version that doesn’t increase the wrist circumference as I mostly plan to wear this over sleeveless dresses. If I was making a jacket I wanted to layer over something with sleeves, I’d add even more and let the wrist enlarge as well. For this version, I am happy with the fitted wrist area. Interfacing: Many reviewers mentioned leaving the interfacing out of the collar/lapel and being happy with the result so I tried that. I would interface next time. I think the collar lacks body and will not fold correctly when I put the jacket on. I hate having to fuss with a collar every time I put on a jacket. I might even go so far as to double interface the collar area at the back neck. This would give the jacket a better finish. Pieces-parts: I might buy a few more copies of this pattern next time there is a sale because when you cut the pattern apart to make the different views, you end up destroying the pattern for any other view as the pieces are drafted on top of one another. Yes, I could have traced off the parts for the view I wanted, but my time is too valuable to bother with that when the pattern can be had for under $2. 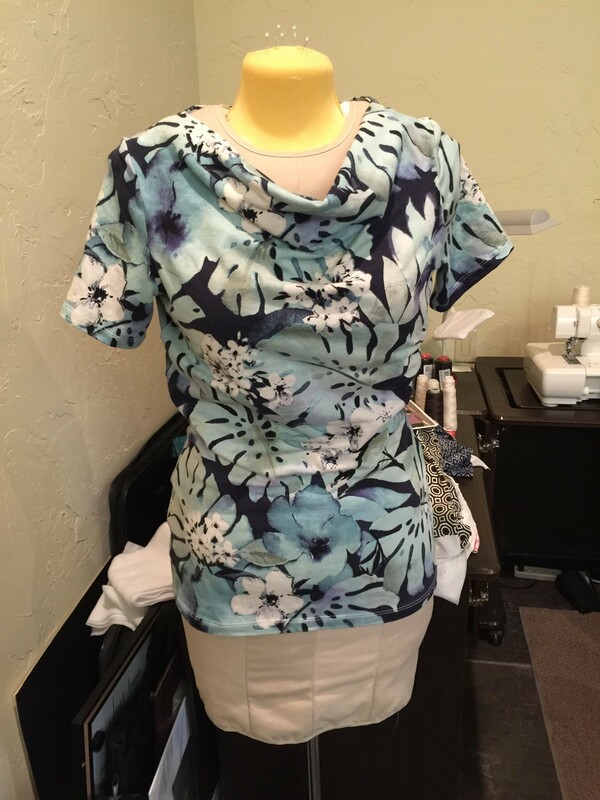 I think I want to try the peplum-less view and the longer view with the straight hem. For the French Terry: I think I will look for a different pattern. I think this one begs for a more refined fabric with nice drape. Maybe New Look 6315 ? Anyway, something a little simpler. So if I use 6844, not one of the peplum views. Underneath the jacket is a beach cover-up I made just before the jacket and reviewed here. Another terrific McCall’s pattern. I’ve always had better luck with McCall’s than other pattern lines. 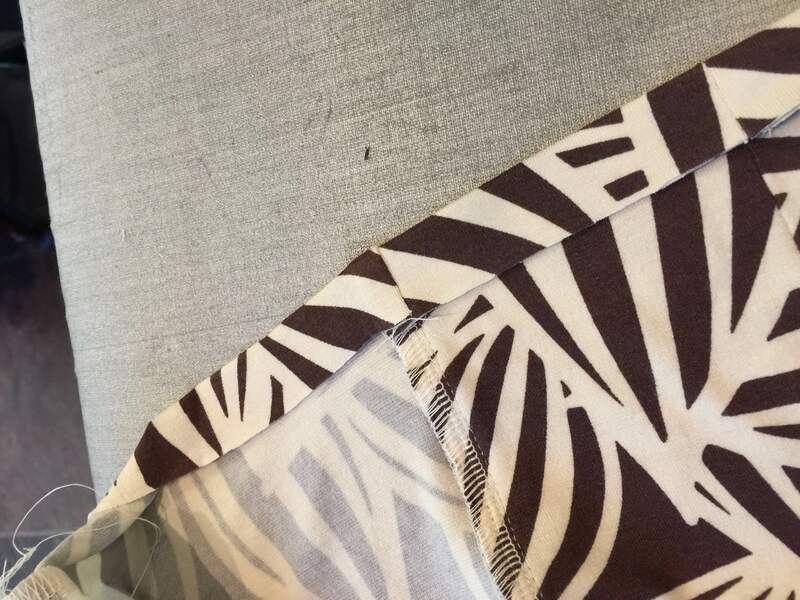 I confess to having bought new fabric for this project, but I sewed it up within a couple of weeks of purchasing and it never made it to the stash. Whew! Close call. I also confess to having bought 2 pieces of fabric from the 4th floor remnant area of Britex in San Fancisco a few weeks back and you can see the offending Britex bag peeking through from behind the right side of the dress form if you really look. A bit of a backslide on the stash reduction project, but overall, still making progress. And yes, I ironed out that wrinkle on the front of the jacket before I hung it in the closet. Oh yeah, Something old is the navy ponte (about 5 years or so in the stash) and the something new is the fabric for the cover-up. These new crops could use a press, but I just pulled them out of the dryer after wearing them today and it’s late and I’m lazy, so there you are. You’ve seen this top before. Now there are crops to go with. 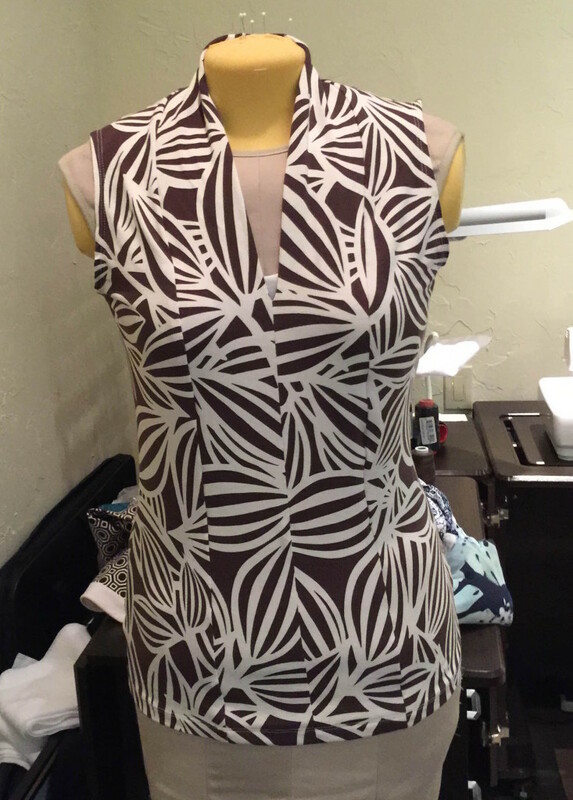 Really, this is a test of a Burda pattern that I want to use for some nice solid twill in a deep khaki/taupe from the ever-diminishing stash. 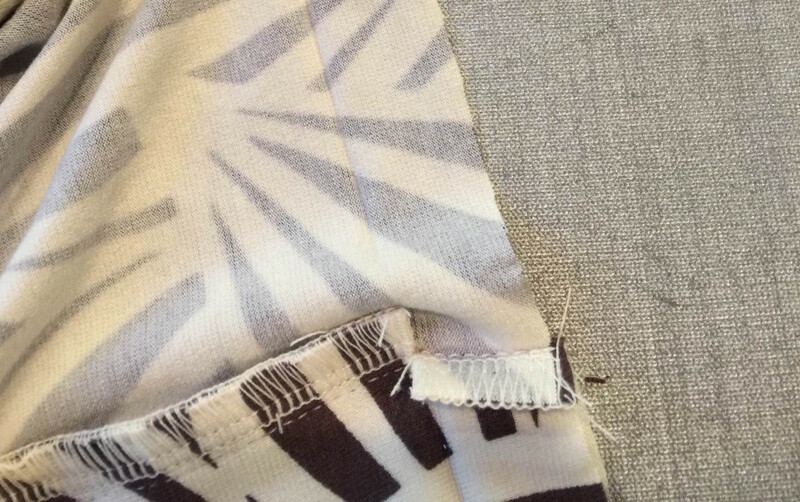 Okay, I confess I bought some t-shirt fabric when I went to buy the zipper(s) for these 2 pairs of crops, but that’s still an overall reduction and if I sew the t-shirt fabric right away, it won’t ever add to the stash. And it’s so rare to find a decent t-shirt knit at a local fabric store I buckled under the pressure. The reason this post is titled Forbidden Fabric is that when I moved and sorted the stash, I had help and my help declared this fabric out of bounds and tossed it into the charity box. 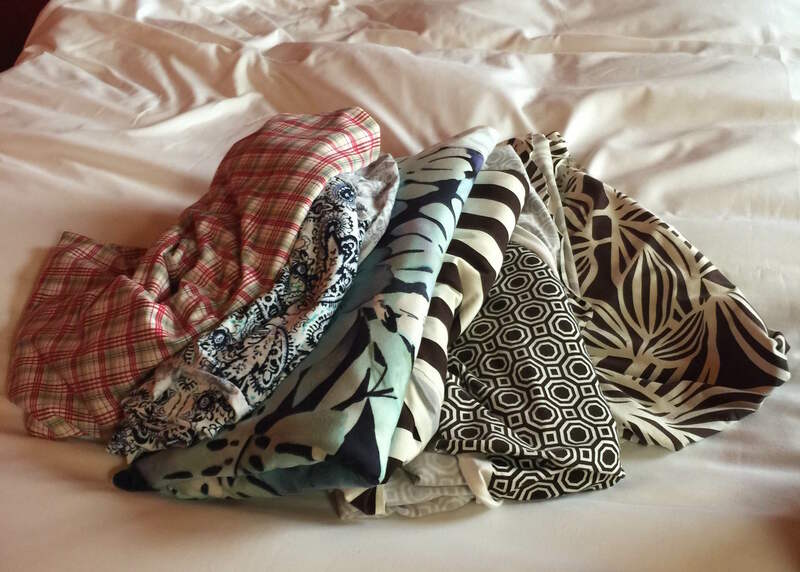 In fact, the last two projects I’ve sewn are of rescued fabric I was forbidden to sew/wear. Since the garden of Eden, forbidden things are the hardest to resist.